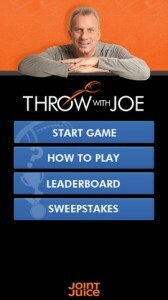 Throw With Joe is an iPhone game developed by Joint Juice. 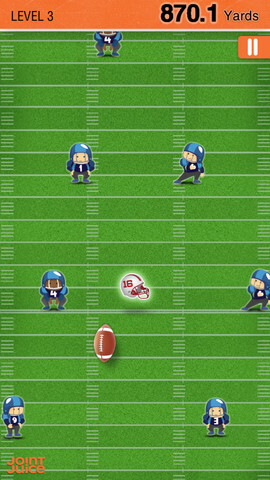 Featuring the likeness of Joe Montana (yes, THE Joe Montana), this game lets you charge thousands of yards down an endless football field. It might seem surprising that a health supplement manufacturer would have interest in developing an iOS game, but the partnership between Joint Juice and aging (thought still legendary) football player Joe Montana makes good sense. Proceeds from sales of this app go to a good cause: the Arthritis Foundation. Throw With Joe is simple, yet satisfying. Your goal is to rush for as many yards as possible and avoid getting tackled. The controls are pretty straightforward. 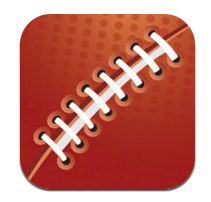 Tilt your device left or right to dodge obstacles, and grab Joint Juice powerups to gain bonus yards. It hardly seems fair to criticize a game’s controls for being too sensitive, but Throw with Joe gets perilously close to having tilt controls that are too responsive. You don’t need to move the phone very much to send your player running off at an angle, and moving the phone too much will send you careening into the walls. Needless to say, mastering these controls may take a couple of runs. To keep things interesting, there are powerups, such as a helmet powerup that makes you invincible for several seconds. Unlike real world football, you can rush for thousands of yards in one go, which makes this simple game a lot of fun for “endless runner” fans. You can also check in on the leaderboards to see how you stack up against the competition. 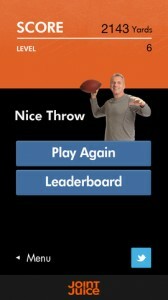 Overall, if you love football, runners, or “The Comeback Kid” himself, check out this app. It’s really simple, but quite fun. And of course, it’s all for a good cause. Throw With Joeis compatible with iPhone 4, iPhone 4S, iPhone 5, iPod touch (4th generation), iPod touch (5th generation), iPad 2 Wi-Fi, iPad 2 Wi-Fi + 3G, iPad (3rd generation), iPad Wi-Fi + 4G, iPad (4th generation), iPad Wi-Fi + Cellular (4th generation), iPad mini and iPad mini Wi-Fi + Cellular. Requires iOS 5.1 or later. This app is optimized for iPhone 5.